If you have got hungry then in the terminal building of the Ulyanovsk (Barataevka) international airport modern convenient cafes are open for you. The “Airport” cafe is located on the second floor in the left side of the air terminal building. We offer to our guests and passengers to pass their time prior to departure or the time of awaiting the arrival of a plane comfortably and not only to order a cup of coffee or tea but also to eat tasty dishes. The carte in the café contains as European as Russian national dishes as well as different deserts and drinks. 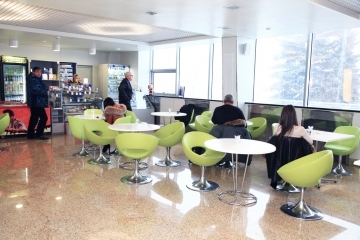 One more café is located in the secure zone of the airport on the second floor and is destined for departing passengers who have completed the preflight inspection. We wish you a nice flight!